How old does my child have to be to go to camp? Campers must reach minimum age by Sept 1 of the same year. For Wildlife Camp, campers must be 10 - 15. 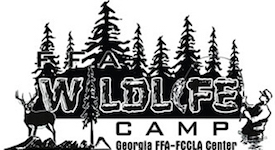 For Advanced Wildlife Camp, campers must be 11-16. What age are your counselors and what qualifications/certifications must they have? Counselors must have completed at least one year of college. All counselors are CPR//First Aid certified, drug tested, and have completed onsite orientation and training. Junior counselors must be at least 15 years old and have attended Wildlife Camp for 2 years. Where do the campers stay and do the counselors stay with them? Campers will stay in air conditioned bunk cabins. The cabins have twin bunk beds and a bathroom with multiple sinks, stall showers, and stall toilets. The counselors have their own room in the cabin with a separate bathroom. Who are the Wildlife Camp Instructors? Instructors are made up of trained Wildlife Camp supporters. All shooting sports instructors are trained and certified. Can my child call home? We do not allow campers to have cell phones while at camp. Campers may call home only in the case of an emergency. Due to the packed schedule campers will not have access to a phone. Campers may only call home through the nurse or the educational program director. It is recommended that parents only call the center in the case of an emergency. What all will my child be doing at camp? Campers will rotate through educational classes throughout the day. They will have 2 hours of free time, a night assembly, and a night activity. It will be a full day of hands on learning. How do I register my child for camp? Complete a registration form (online, request a brochure, or request one be faxed) and mail it in with a $100 deposit. Your child is not registered until the deposit is received. We accept checks and money orders. Can I volunteer to help at the Wildlife Camp? Parents/Guardians can serve as volunteers helping in various classes or with campers. Volunteers that stay the entire week will receive one scholarship for a child to attend camp. Volunteers must complete a volunteer application and be selected. When is my balance due? The balance is due at check-in on the day camp starts. Express check-in will be available to those who send in the remaining balances and forms prior to camp. Can I get my money back if my child decides not to come? The $100 deposit is always non-refundable. If the child is paid in full the balance may be refunded if the spot can be filled with plenty of notice. Can I get my money back if my child does not complete the entire week? In emergency cases only partial refunds may be refunded at director's discretion. What if my child has medications or medical concerns? Is there a nurse on site? A nurse will be at Wildlife Camp 24 hours a day. All medications will be administered through the nurse and must be turned in at registration. Parents/Guardians will have the opportunity to speak with the nurse at registration. Can I send my child letters from home? Option 1. Email to FFAWildlifeCamp@gmail.com. This is the fastest method. We will print and deliver your message to your child! Option 2. Send mail. Because mail can often be delayed getting to us, we cannot guarantee that your child will receive the mail before they leave. If you choose this option, we recommend that you send the mail at least one week prior.